How much focus should affiliates place on CrossFit as a sport vs. CrossFit as a training method? Several box owners explain their approaches. Consider this: The CrossFit methodology existed for 33 years before the inaugural CrossFit Games. Yet, Ben Bergeron has noticed a trend of late. “A majority of the affiliates are programming for their athletes like they’re going to compete in the sport. They haven’t recognized the difference between the sport of CrossFit and training with CrossFit,” said the coach to multi-year CrossFit Games athletes Chris Spealler, Michele Letendre and Becca Voigt. 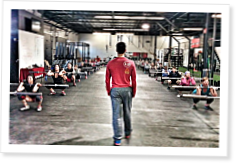 Bergeron’s gym, CrossFit New England in Massachusetts, has been an affiliate since 2007, and today Bergeron is a member of CrossFit’s Level 1 Seminar Staff. Elite-level competition does not define CrossFit, emphasized CrossFit HQ’s Pat Sherwood, a former member of the Level 1 Seminar Staff who plans to open an affiliate in San Jose, California. Therefore, it’s folly for affiliates to focus on elite-level competition as the end goal, he continued. Most athletes who walk through the door are simply trying to become better at everyday activities—better at life, Sherwood said. Competition drives innovation. Therefore competition helps drive training methodology.. affiliates need to be aware of memberships desires and abilities in consultation with the athletes goals and abilities.